With the rise in unemployment, many people are looking elsewhere for opportunities to make money, turning away from 9 to 5 jobs. One way that I find highly sustainable is to start an online business, leveraging on building email list to promote affiliate products. 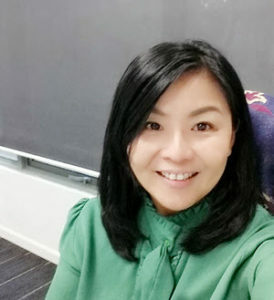 Despite there are many other ways recommended by marketers around the world to generate income from online business, I still find email marketing is the most effective method. So what is email marketing about? Email marketing is one type of direct marketing that uses electronic mail to regularly communicate content or offer to its targeted audience. In short, every email sent to a potential or current customer could be considered email marketing. Ok, before you can start email marketing, you must first have a list of potential customers who are interested in your niche. To identify people who are interested in your niche, one way is to invite them to subscribe. When people subscribe to your list, this shows they are interested to know what you will want to show and promote to them later on. If you continuously provide value to them by sending them emails, trust can be established and they will be more likely to purchase whatever product or service offered by you. Email marketing is about sending targeted content to the right list to get more chances to generate sales. Therefore it is important to get the right email list to support your future marketing effort. Many people have the misconception that building email list is difficult and can take a lot of time and resources. If you have the right tools, things can become simpler and more efficient. Here are the tools that I used to effectively build my email list. I don't even need any technical skill to start with. Different groups of people would have different approaches toward getting email list. But no matter how diverse these methods are, there are always some key success factors involved. Here are five things you need to know in order to effectively build and keep the right list for your business. Put up a good web form on your blog can increase the chances of your offer being noticed. You can choose to have a welcome mat when people go to your blog, a small pop-up while people are reading your post, action boxes on sidebars or after each post, a scroll box that slide in from a corner, notification bar on top of your blog or even a unique landing page. Here is a detailed explanation on the differences of each web forms. A web form with good design is very easy to create. With WP Profit Builder creating a professionally designed web form only requires a few clicks. What you really need is just to find a great image (here's how you can get free images), write compelling headline and include a short description of your offer on your web form so people are clear about what they are going to receive upon signing up. If you are not good at writing, I suggest you to checkout Textbroker where you can find freelance writers to do for you. The lesser details you are asking them to fill up, the better response will be. Therefore, I suggest to only include name and email field on each opt-in form. This is how you can create an opt in form. To encourage more visitors to subscribe, you need a compelling offer. One way is to give away free ebook with content that may interest them. You can write an ebook on the niche that you are working on. 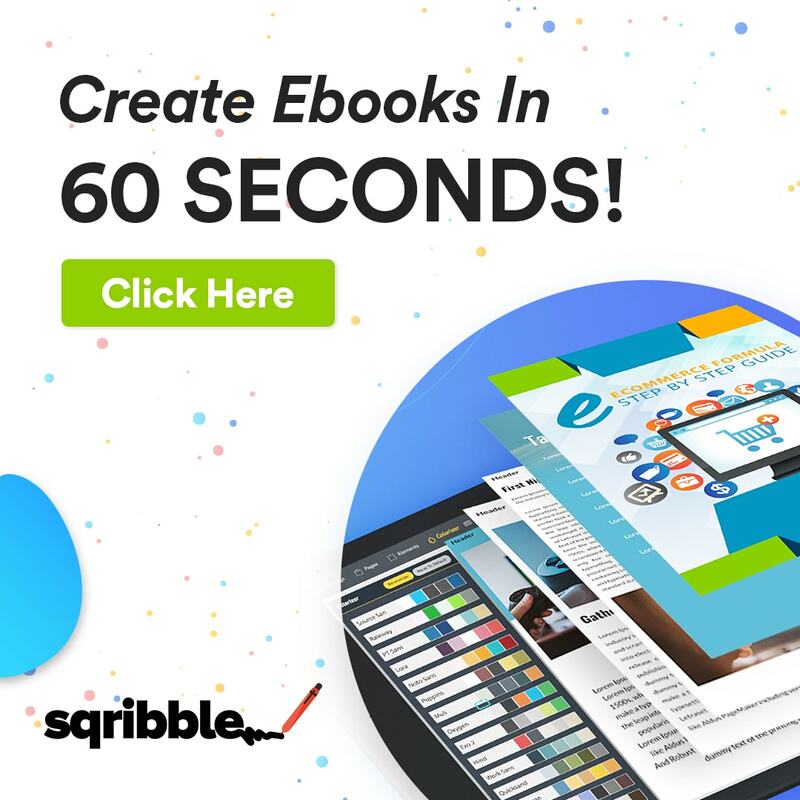 To quickly create your first ebook, I recommend you to use Sqribble. It is a very powerful ebook creator software that enables you to create a professionally designed ebook in seconds. You can learn more about this powerful ebook creator software here. For example, I created an eBook on Beginner's Guide to Blogging Success for people who are interested to start blogging. A good e-book should be brief and straight to the point preferably not more than 30 pages in total. Most people prefer to consume content in the form of images rather than text. Therefore, remember to include good images too. Attractive and high definition images will help to keep subscribers continue reading. This includes attractive book cover to leave a lasting impression. To optimize content of your ebook, I suggest you to include some affiliate links onto the content to promote your offer. But remember, only include offers that can complement your content and adds value to your subscribers. This is important to build trust and can help in strengthening future relationship. For those who do not want to spend too much of your time creating ebook, you can select ready-made e-book here with 15 niches for you to choose from. Other than ebook, free give away can also include video tutorial, list of useful resources, templates or anything that is relevant to you niche. Your homepage is your brand image and leaving a great impression to your visitors is as important as creating high quality content. Regardless it is colour combination, fonts, structure or even images, all must be synchronized completely to enhance visual effect. When someone landed on your homepage, there are only likely to stay on if your content is readable, site speed is acceptable and design is visually appealing. Not all people have dedicated internet connections, therefore the faster your blog gets loaded, the better it is. You can find good theme for your blog here. Make sure your blog is simple yet contains sophisticated knowledge. Remember, when you can make your visitors stay longer on your blog, it will increase the chances of them signing up for your offer. A return customer is more likely to bring in more business. When you provide high quality offers, your existing subscribers are more likely to continue subscribe or buy your future offers. You must be wondering why there is a need to get your existing subscribers to re-subscribe when they are already in your list. It is all because of the need to continuously keeping your subscribers inside your sales funnel. As long as they are still inside your sales funnel, you will be able to promote them products of higher value – one that can bring you higher profit. However, many marketers focus on getting new customers and neglected the fact that existing customers are more likely to buy products of higher value from you. In fact, existing customers are also more likely to recommend new customer to you, thus indirectly will become your affiliates. Recommendation and referral alone can rake in more business than an expensive ad does. Therefore, to increase your customer's trust, make sure you only promote high quality offers to them. Never aim to earn more by compromising on quality. The more trust you can build, the better you can keep your customers in your funnel thus increase the chances of getting more subscribers through referral. This will lead to more sales, thus more profit. Never lose the trust of your customers. I've mentioned this word “trust” for so many times and I bet by now you can already relate the importance of maintaining trust in customer relationship. In online business, there are unethical marketers who sell their list to get a profit. And when they do this, it increases the chances of their subscribers getting spammed by unknown senders. Remember, a good reputation will drive in more traffic and subscribers, as well as strengthen the loyalty of your customers. The money you generated from selling your list is never a sustainable business model. 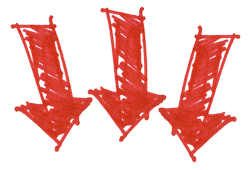 One day your list will be frustrated and become indifferent to all offers. When they found out about their details are being given to a third party, you can even get sued due to violation of Personal Data Protection Act. So, what is the best way to profit from your list? The only way you can continuously generate income from your list is by constantly providing value to them, and occasionally promote them your best offerings. This is my best offering and also one that helped me build my online business. To efficiently and constantly deliver value to your subscribers, you can create an auto-generated email (auto-responder) using AWeber and send to your subscribers at pre-determined time. This is also the only email marketing tool that I used to build my list. 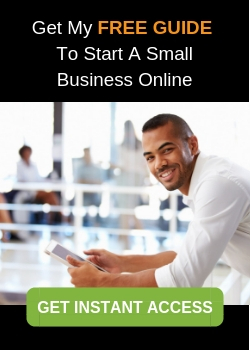 Whether you are unemployed or not, a youth or a working professional, or even if you are a small business owner, as long as you want to build a profitable online business , I am always here to help. I hope with this, you are more aware on what is email marketing about and the various ways to effectively build your email list . If there are other things about earning money online (here are 50 proven legitimate ways to earn money online) that you want me to share, drop me a comment below. p/s: Please help me to share this post with your followers in Facebook or Twitter if you find this useful. 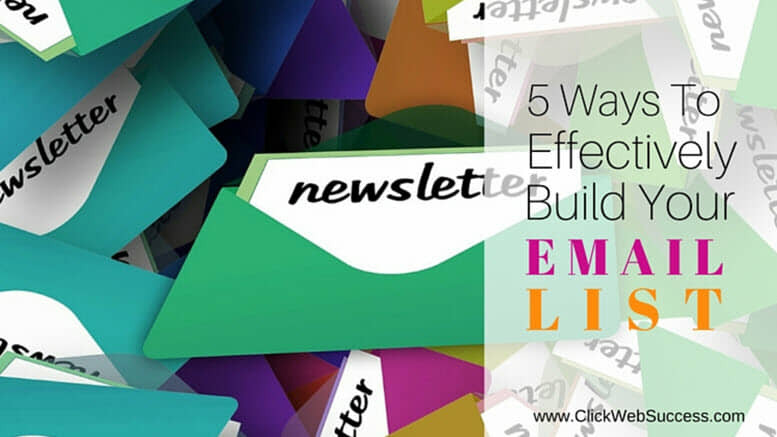 6 Comments on "5 Ways to Effectively Build Your Email List"
I have a question about e-mail marketing. Is it required that my address (current location) should be displayed? I used to live in Singapore and I receive quite a few e-mail sign ups back then even without an e-book. After I changed my address to Philippines, I noticed that I either get unsubscriptions or no sign ups at all. I already stopped trying to collect e-mails and just focus on writing. Yes, address is important but I don’t think there’s any relevant with your address. People who subscribe to your list want to get more updates or valuable content from you. Have you been sending them? I would suggest you to create an eBook that is relevant to your niche and send to them as follow up emails. This can re-engage with existing subscribers as well as attracting new subscribers. I find Sqribble a very powerful tool to create professionally designed ebook. You might want to give it a try. Awesome topic Florence! I must say that I have heard so positive things about email list building but I have never tried to build it because I don’t know what should be my offer to customers. Do you think that it is worth to use free email list services like MailChimp or paid ones? I started my list building with AWeber. Is a paid service with 30 days free trial but as you grow bigger list, it is cheaper than MailChimp. So far am happy with this service provider. It is common to offer ebook, industry reports or templates as lead magnet to get people to subscribe. It was quite challenging during those days to create one. But now with Sqribble, a powerful ebook creator software, building one is just like ABC. Very well put together post, Florence and even though I haven’t started an e-mail list yet it is definitely something I want to be aware of in building that part of the business. The reason I don’t have a list just yet is because I haven’t gotten to that part of the BootCamp training. How long have you been growing your list and how many subscribers do you have so far, if you don’t mnd my asking? Did you have any issues with trusting this when you first started your list? Or fealings of guilt that you may be imposing on someone? I started list building few months after building my website and luckily now has some sufficient list to run my business. But when I started, it was tough to create an ebook as lead magnet. Tools available back then is not as powerful as what we have now. But luckily there’s Sqribble, an ebook creator software, creating is so much easier and hassle free. I highly recommend you to start building your list.